On Twitter, Buffalo Police said the student suffered a medical condition of a serious nature, that might have stemmed from hazing. In a written statement, UB President Satish K. Tripathi said the incident involved the Sigma Pi fraternity and that he idled the Greek life organizations, because of the university's ban on hazing. "As the investigation into this very serious matter continues, let me reiterate that our university has zero tolerance for hazing," Tripathi's statement said. "Not only are hazing incidents a violation of our university policies, but they are also crimes." "We have reached out to the student’s family and are providing all the assistance and comfort we can to them during this incredibly difficult time," Tripathi added. "I ask you to keep this student – one of our own – and his family in your thoughts." Just after midnight Friday, an ambulance crew was dispatched to 69 Custer St., scanner communications archived by the website Broadcastify indicate. Photos found on social media indicate the residence is connected to Sigma Pi. A caller had told a dispatcher that a person was on the front lawn in cardiac arrest. Minutes later, the ambulance crew radioed that it was rushing a man – still in cardiac arrest – to Buffalo General Medical Center. The ambulance was en route "hot," meaning its lights and sirens were activated. Lavontae Armwood, a UB senior who lives next to the fraternity house, said he saw four or five guys carrying a person out of 69 Custer. They placed him on the front lawn, Armwood said. Three or four of them ran from the scene, while one stayed with the victim, Armwood said. In all, there were about “20 kids running across the parking lot trying to get away,” he said. “They had him out on the grass, and then a bunch of the kids starting running,” Armwood said. At about the same time, emergency crews showed up and started performing CPR, Armwood said. “I was just in shock,” Armwood said. “We saw the unconscious body right here in that corner,” said Adam Rodriguez, Armwood's roommate, as he pointed to a corner of 69 Custer, “and we just saw the paramedics working on 'em – chest compressions, giving oxygen – I want to say for a good five, 10 minutes." Mike Young, 20, of Orchard Park, a sophomore at UB, has lived since August in a house three doors down from the Sigma Pi fraternity house. Young said he was not surprised to see police cars on the street overnight. “I knew there were frat houses down here. It was kind of surprising that they shut down all of Greek Life which, I guess, is a good idea based on what happened," Young said. “I was finishing up homework and I saw about six patrol cars lined down here and an ambulance leave at like around 2 a.m.,” he said. Young said he did not really know any of the occupants of the frat house. “I’ve run into a few of them just as we’re parking cars down the street, but none of them had ever been disrespectful or unruly,” he said. 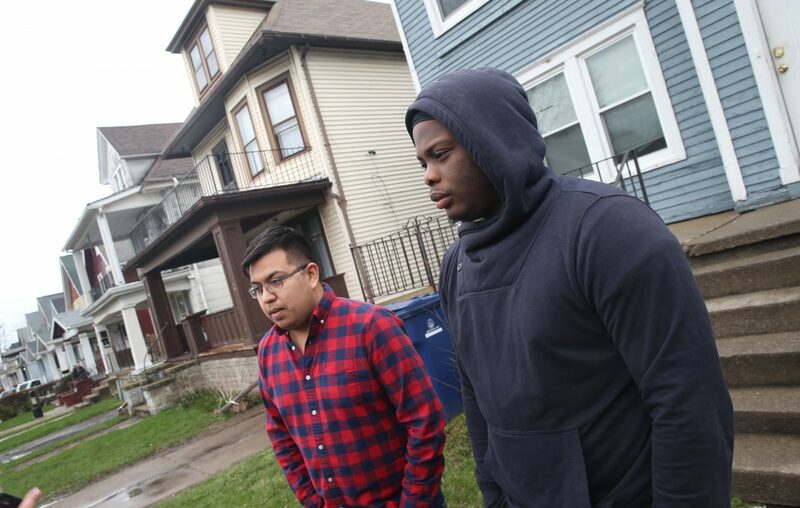 Rodriguez said he is not sure how many people live in the fraternity house, but it’s not uncommon for them to throw parties at the home on Thursdays, Fridays and Saturdays. “Sometimes you get 15 people going in at one time, sometimes there’s a line, sometimes they’re rejecting people because there’s no room,” said Rodriguez, a junior at UB. UB spokesman John DellaContrada added that UB Police are working closely with Buffalo Police to investigate the suspected hazing incident. Officials will also review the fraternity's activities, he added. He said the student is a UB undergraduate. Neighbors came and went Friday. In addition to two-story, Cape Cod-style residences on Custer Street, a red-brick senior citizen housing facility is tucked back far from the curb. Some neighbors described a tension between the family homeowners and some of the student residents on Custer. Much of the housing on the street caters to UB students. Most are not fraternity or sorority houses, but such residences come and go quickly, neighbors said. Sigma Pi has had hazing-related deaths at other colleges around the country, the website of its international headquarters indicated. Calls to Sigma Pi in Buffalo and the headquarters in Lebanon, Tenn., were not immediately returned Friday. Sigma Pi Fraternity International was founded in 1897 at Vincennes University in Indiana, according to the SUNY Buffalo Sigma Pi Facebook page. The Epsilon Omicron Chapter at SUNY Buffalo was founded in 1979. Sigma Pi has more than 120 chapters across the United States and Canada. News staff reporter Harold McNeil contributed to this report.